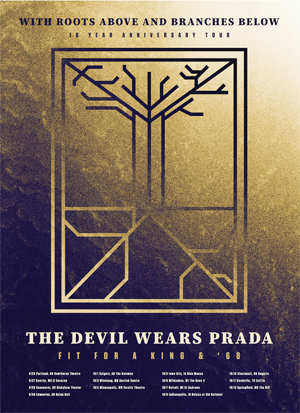 THE DEVIL WEARS PRADA Announce Second Leg Of "With Roots Above And Branches Below Tenth Anniversary Tour"
THE DEVIL WEARS PRADA are pleased to announce their new label home! The band has signed with Solid State Records for its next album. Details about TDWP's Solid State label debut are TBA. The band is also excited to announce the second leg of its very special anniversary tour this fall. The band is extending its trek celebrating the upcoming tenth anniversary of their landmark third studio album With Roots Above and Branches Below. TDWP will be playing the album, which arrived on May 5, 2009 via Ferret Music, in its entirety. FIT FOR A KING and '68 appear on both the first and second legs of the tour. The first leg of the tour kicks off on September 27 in Seattle and runs through October 12 in Springfield, Missouri. The trek includes several stops in Canada, as well. The second leg launches on November 23 in Chicago and wraps on December 16 in THE DEVIL WEARS PRADA's native Ohio.